My little guy is eating a lot more finger foods now. I've been trying to come up with yummy ways to incorporate dark greens, like spinach, in his finger food. 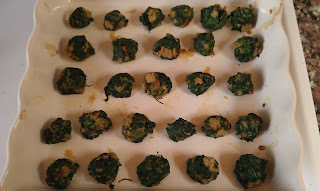 I've made spinach balls for adults before, but they were made with salt, pepper, butter, and stove top mix. 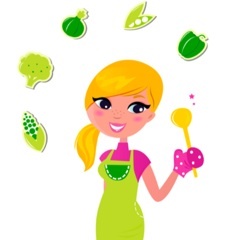 Not very good for baby, so I had to tweak the original recipe to come up with a healthy and yummy option for baby. I made these for my little one today for lunch, and he really liked them. I'm not going to lie, I had a few too and they were delish! This is for babies 9+ months. 2 slices of whole wheat toast without crusts. Made these this morning! Katy seemed to like them. THe only problem I had was that I think I didn't squeeze enough of the water out of the spinach, so the balls were a little difficult to form. Glad she liked them! That happens to me sometimes too. You can add a little bread crumbs to soak up the water, or more toast. Great post, you have pointed out some excellent points, I as well believe this is a very superb blog. Please keep up the effective work. Good for an adult snack too.